My father reconnected with a second cousin of his recently, so I've been spending time on my own personal research for a change. Its been a while. The cousin is a Catchpole, and his grandfather married into our Boother line, by marrying my great-grandmother's sister. I needed to collect the information from our Catchpole relative, and also go through some information sent to me by another distant Boother relative sometime ago, as we wanted to know more about the Catchpoles and he wanted to know more about the Boothers. While going through my lines, checking and updating with the new information, and verifying the information sent by our Boother relative, I noticed a young man who'd died in 1914: James Daniel BOOTHER. He is my great-great-uncle, younger brother of my great-grandmother Jessie WARD (nee BOOTHER). Apart from that, birth year and death year, I knew nothing else about him. Mostly I tend to concentrate on my direct line back - unless I have a brickwall, and need to do sibling research to get passed it. As he had died at 28, early on in the First World War, I decided to focus on him, and see what I could find out. Especially since I am concentrating on the annual Trans Tasman Anzac Day Blog Challenge that I do for work. Using the FindMyPast website, I found him in the 1891 UK Census as a five year old, with his parents George and Margaret BOOTHER, and his five siblings. They were living in Sittingbourne in Kent, and his father was working as a bricklayer. In the 1901 UK Census, James was 16 and working as a "Trade Boy". The family was living in Sheerness, now with only four of his siblings - his baby brother George (a twin) had died shortly after the previous census. Their father was working as a general labourer. I have not been able to find our James in the 1911 UK Census in FindMyPast, so as any researcher would do, I switched to looking him up in Ancestry in the 1911 Census. I found him. In India. In the Army. According to the 1911 Census on Ancestry I discovered that he was Private James Daniel BOOTHER 2/Royal West Kent Battalion. Looking at the transcription index on Ancestry of the UK Soldiers Died in the Great War, 1914-1919, it listed James BOOTHER as Private, number L/7860, 1st Battalion Queen's Own (Royal West Kent Regiment), killed in action in France and Flanders in the Western European Theatre of War. Checking for the same information on FindMyPast, gave me additional information that he was in the 13th Brigade, 5th Division and his regiment had been deployed to the Front from where they had been stationed in Dublin. It gave further movements of where his brigade was deployed, but of course he was no longer with them at that point. Although landing at Le Havre on 15 August 1914, sadly James was recorded as killed in action on 23 September 1914. Ancestry had given me the tip to check the UK, De Ruvigny's Roll of Honour, 1914-1924, (which FindMyPast also has) and I discovered another listing for him there. Unfortunately, it didn't have a photo of him - I would have liked that. BOOTHER, JAMES Private No. 7860, 1stBattn. Royal West Kent Rgt., s. of George Boother, of 25 Short Street, Sheerness; served with the Expeditionary Force; killed in action 23 Sept 1914. Searching FindMyPast's death indexes found James on the Index to War Deaths 1914-1921 Army and other ranks (GRO War Death Army Other Ranks (1914-1921). This gave no new information, but confirmed what I had already found. It does however, provide me with the reference numbers to obtain a death certificate, if I wish to do so. At this point, I wanted to know where he was buried, so I turned to the Commonwealth Graves Commission website (CGCW) and searched for James there. I found a listing for him on the La Ferte-sous-Jouarre Memorial. Opening the spreadsheet for this listing, confirmed information I already knew, plus informed me that he was the son of Margaret Boother living at 3 Kent Street, Blue Town, Sheerness and the late George William Boother (??). This raised questions, as I have information of George William Boother dying in 1917, and it seems strange the parents aren't the same address. However, I decided that this is probably a red herring - the memorial was no doubt created after 1917 when George Snr had already passed away, and his wife was living in a new address. I searched the CGCW website for the memorial in question, and discovered that its in a small town 66kms to the east of Paris. It commemorates 3740 officers and men of the British Expeditionary Forces who had fallen during the battles of Mons, Le Cateau, the Marne and the Aisne, between the end of August and early October in 1914. The Battle of the Marne, referred to in the French press as the ‘Miracle of the Marne’, halted the month-long advance of the German forces toward Paris and decisively ended the possibility of an early German victory. The battle also marked the beginning of trench warfare as Allied and German forces entrenched during and after the Battle of the Aisne in mid-September. By November battle lines had been drawn that would remain virtually unchanged for almost four years. The British Expeditionary Force suffered almost 13,000 casualties during the Battle of the Marne, of whom some 7,000 had been killed. Which sounds pretty much like the British Expeditionary Force saved Paris (for the time being) at very heavy cost. The website also explains that the memorial wasn't created till 1928, which confirms the red herring. (Be careful when researching, not to add two and two together and make five!). Ancestry had suggested I go and look for more information about James at the FindAGrave website. It confirms information I already have, but also adds the information that his final resting place is not known. 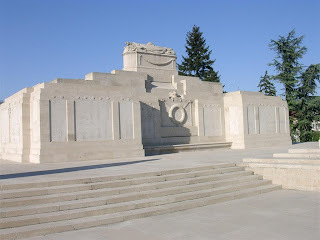 It gives a very good description and a lovely photo of the memorial from different angles. It also says that the almost 4000 men lost during the First Battle of Marne are commemorated all have no known grave. Back at Ancestry I discovered a medal card for him, from the British Army WWI Medal Rolls Index Cards, 1914-1920 dataset. James had been given The Victory Medal, The British War Medal, the 1914 Star and the clasp to the 1914 Star. I have ordered more information from the National Archives in UK, Documents Online, through the New Zealand Society of Genealogist's free research service, as I am a member! As James had enlisted in the Army by the 1911 UK Census, he was obviously a career soldier, having served in India and Ireland (and possibly other places) before serving in France. I doubt that anything would have prepared him for the realities of WWI, the battles in France and Flanders and the trenches. My 2x-great-uncle is not an ANZAC, but this year I will remember him at the ANZAC Day service and wear my poppy for him, as this is the day that New Zealanders commemorate their fallen. 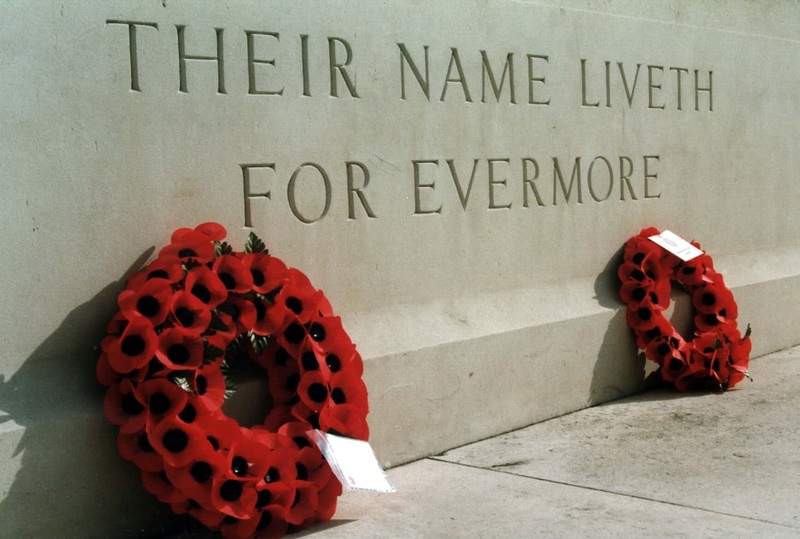 My family in the UK may choose to do the same on Armistice Day in November. What a journey these things take us on and we learn so much. Hope you find a photo one day! I relate to your too-ings and fro-ings LOL ...reads so much like my researching life also!!! Thanks Sandy. Aren't we lucky to have all this wonderful information online though?! Makes it so much more accessible! Great story and great detective work! Regards Karl.